Sister Annette is a small person born in a small country. On a bright, sunny but cold morning in January 1907, Marie Albertine Heymanns was born in Beringen, Anton Marsch, Luxembourg. When she was a teenager, she came to the United States and settled in Sheboygan, Wisconsin with her parents, five brothers and two sisters. The family belonged to Holy Name Parish, and Marie attended evening classes at Holy Name School. She began working at St. Nicholas Hospital and came to know the Hospital Sisters. It was this connection that led Marie to enroll at St. John’s Hospital School of Nursing in Springfield, Illinois in 1924. After further association with the Sisters, Marie knew that her life’s call was to become a member of the Hospital Sisters of St. Francis. On April 19, 1927, Marie entered the Community. Following her initial formation, Marie, now Sister Annette, professed her religious vows of poverty, celibate chastity and obedience on November 5, 1929. She then returned to St. John’s School of Nursing and graduated in 1934. Soon after graduation, Sister began working in the Surgery Department of St. John's Hospital. She has the distinction of being the first nurse to administer intravenous fluids at St. John's. In 1950, Sister Annette was transferred to Sacred Heart Hospital in Eau Claire, Wisconsin where she continued to work in surgery. She returned to St. John’s in 1959 and remained active there for the next 42 years. Sister Annette realized the need for ensuring the proper distribution of supplies in order to provide patients with the best care. So she started the Central Supply Department with nothing but her own ideas. At that time, the function of the department was to hand-sterilize all the equipment, which included syringes, needles and intravenous tubing and properly distribute the supplies to the nursing stations. Over the ensuing years, Central Supply developed into a department that now has 17 employees who provide an integral service to both patients and staff. During her many years of service at St. John’s, Sister Annette was responsible for a total of five geographical moves of the department. In 2001, at the age of 94 and after having served for more that 70 years as a nurse, Sister Annette decided it was time to "retire." 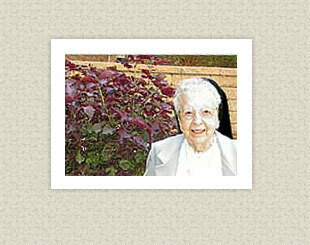 As to her plans for "retirement," Sister now spends more time praying, visiting with her Sisters, and "enjoying life." If her retirement is anything like her years of service, Sister Annette-small but mighty-will be making an impact on activities at the Motherhouse for quite some time!